Sometimes we have to play the hand we're dealt in life. This 1972 Porsche 911S Targa was destined from birth to head over to Japan and sit unused for decades. It's a sad existence, but if it had not been subjected to hardships, it wouldn't be living the life it has now. Alan Drayson of Canford Classics in the UK found this JDM 911S under a lean-to in Japan and knew it had to live again. He imported the car, a left-hand-drive model, back to the UK for a revamp in the spirit of preservation, not restoration. This car tells a story, one that is important both to the car and to the Porsche community. It was at one point well loved, then discarded, then loved again. Rather than put it back to its original level of fit and finish (or foolishly over-restoring it to better than new) the folks at Canford decided the car was solid enough that it could be serviced and maintained, aesthetically. The Body retains its original paint, it has its original heater-element windshield (something I've never seen in person) and original surface rust. It looks like most of the rust is contained to the front and rear lids, and everything else holds together well enough. After giving all of the mechanicals a full going-through, and sorting out some electrical issues, the car gets driven hard, as it was intended to. This isn't the kind of car that you worry about a bit of dust, you just fire it up and go for a rip. 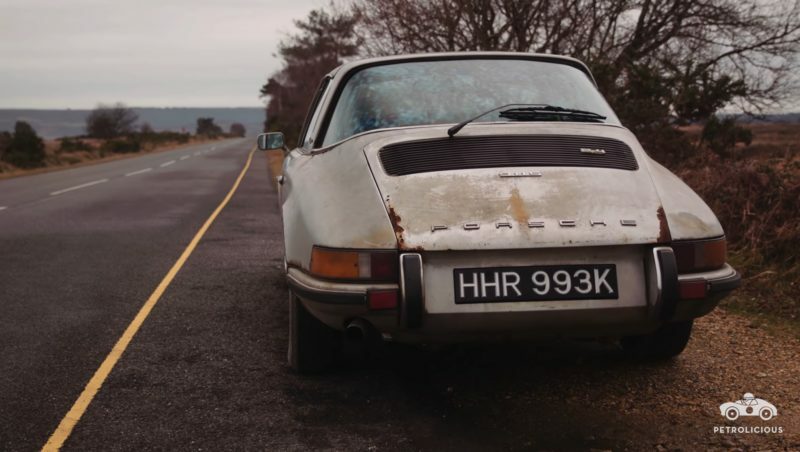 If this car had been restored, it might have ended up in a bubble somewhere, but keeping it the way it was found preserves the story and ensures the 911 will be driven as hard as ever. I love this idea, and it has inspired me to go for a rip in my own Porsche. Perhaps you should do the same, rock chips and surface rust be damned. To nice of a original Porsche to not fix the rust on the body it does not have to be show room just used look for its age.